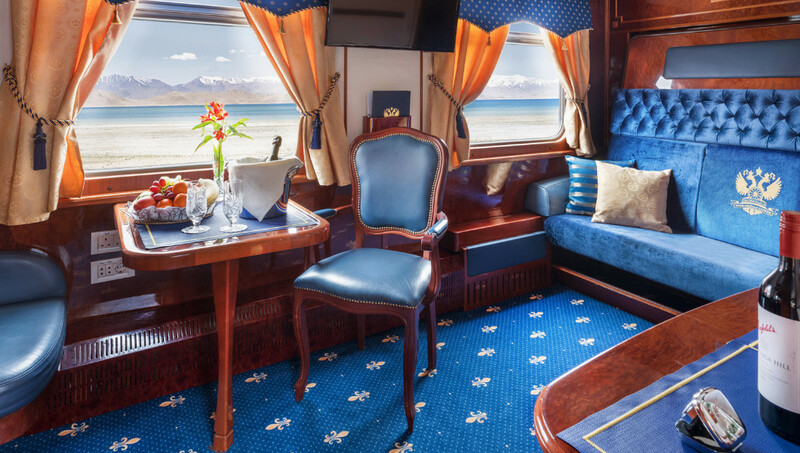 The luxe train journey through Russia comes with a hefty price tag: $87,100 for a couple and the range of ‘Imperial Suites’ sadly aren’t available for any World Cup fans who’ve got a bit lost, since tickets have sold out over a year in advance. The exclusive suite, which can newly be added on to the formation of the Golden Eagle, consists of two bedrooms (sleeping up to four guests), a lounge/dining room, a kitchen and personal chef. 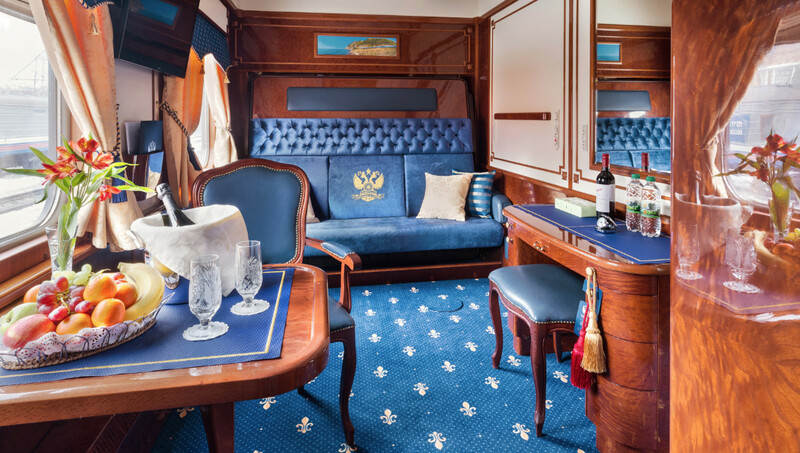 The Romanov Suite became available on all Trans-Siberian routes from last month. Meanwhile all other cabin classes, as well as the Bar Lounge Car, have recently undergone a refresh, with newly upholstered seating and new carpets and soft furnishings throughout. Guests can expect luxury on a lavish scale. The master bedroom is equivalent to the Golden Eagle’s Imperial Suite, measuring 120sq ft and benefiting from a king-size bed, private en suite bathroom and remote controlled air-conditioning and heating. The smaller second bedroom, at half the size, is comparable to the Golden Eagle’s Silver Class cabin, with a small lower double bed, a single bunk-style upper bed, and private en suite bathroom/wet room. Services include a complimentary mini-bar, private guiding and chauffeur in the destinations visited along the way, and laundry service. From the moment passengers step aboard the Golden Eagle luxury hotel-on-wheels, they can relax in the knowledge that everything is taken care of. Fine dining menus, meticulously planned itineraries, cabin attendants and an on-board doctor ensure a care-free experience, while a variety of activities are available on the move too, including Russian language classes and vodka tastings. 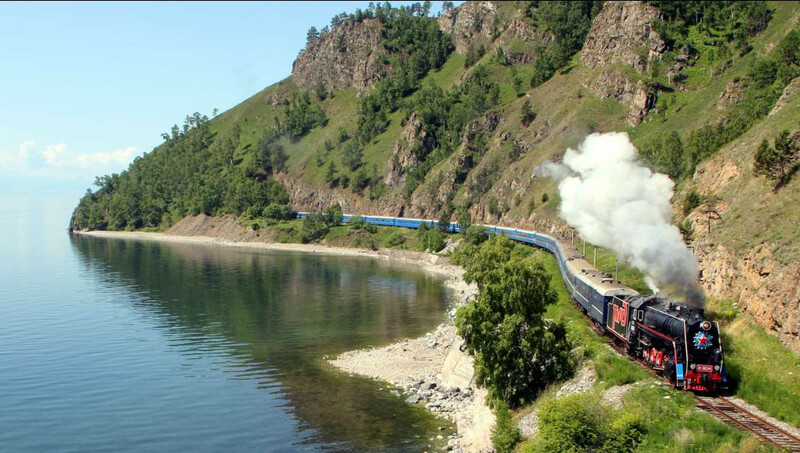 Golden Eagle’s Trans-Siberian Express passage between Moscow and Vladivostok, covering a massive 11,000kms over two weeks, largely following the famed Trans-Siberian Railway, which weaves through Russia’s vast and little-visited interior, over the Urals and across the steppe. Among the many highlights along the way are: witnessing the modern Soviet city of Novosibirsk; enjoying a glass of Champagne with one foot in Europe and the other in Asia at Yekaterinburg, known as the Great Divide. You can also learn to cook traditional Russian dishes in the ‘Paris of Siberia’, Irkutsk; be hauled by a Soviet-Era steam locomotive along the shores of Lake Baikal, the deepest lake in the world; watch a folk performance in the Old Believers Village at Ulan Ude; and, in Mongolia, explore its capital, Ulaan Baatar, and visit a traditional Ger to meet a nomadic family in Gorkhi-Terelj National Park.